Mothers' Day will be really special for me this year, as I'm actually going to be a Mother. Just writing that seems strange even though it's going to become a reality in just a few weeks! I expect the day itself will pass in a sleep-deprived blur so if my husband has any sense he will buy me a Mothers' Day card now! 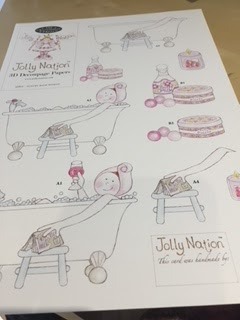 I made some cards at one point early last year with various things I'd come across in my craft stash including this sheet of Decoupage paper from Jolly Nation. It has a hand drawn style showing a woman relaxing in a bath with a glass of wine which is the sort of treat I think mums deserve on Mothers' Day! I used a pink and pale green printed paper for the backing as it reminded me a bit of the sort of wallpaper my mum used to have in her bedroom years ago, then layered the pieces of the decoupage picture on top. I added a small 'mothers' day' sticker I had on a sticker sheet from a long time ago in the top corner. I'm sharing this with Daring Cardmakers where the theme is cosy home, Cardz 4 Galz where the theme is think pink and Watercooler Wednesday where the theme is feminine.